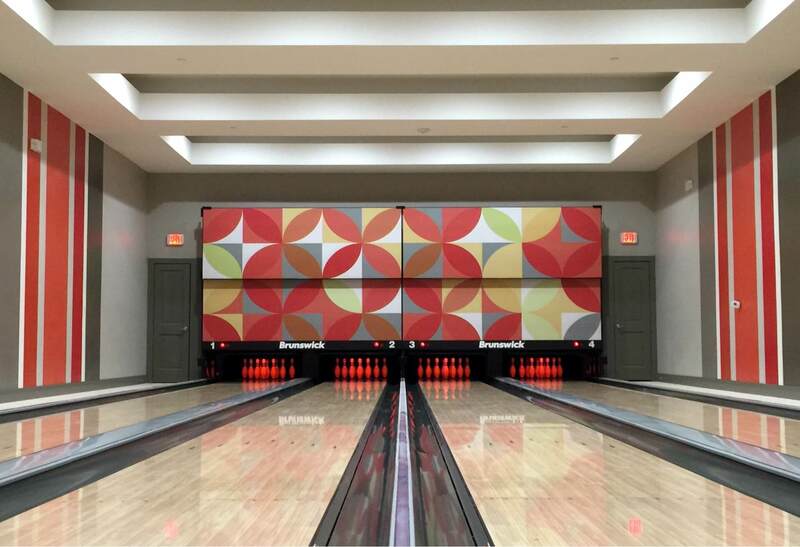 Get inspiration for your project by browsing our home bowling alley photos below. Click on a photo to open a project album. 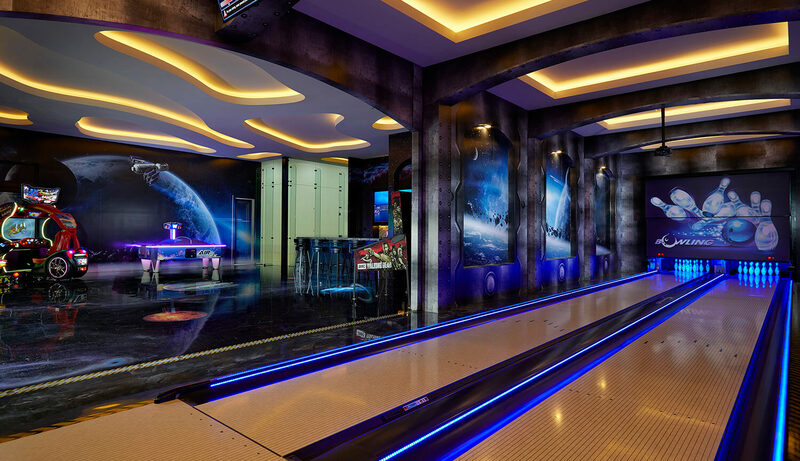 A contemporary residential bowling alley with a modern custom masking unit, custom lanes in "Adaptable Muse" pattern, overhead scoring monitors, and LED down-lane accent lighting. 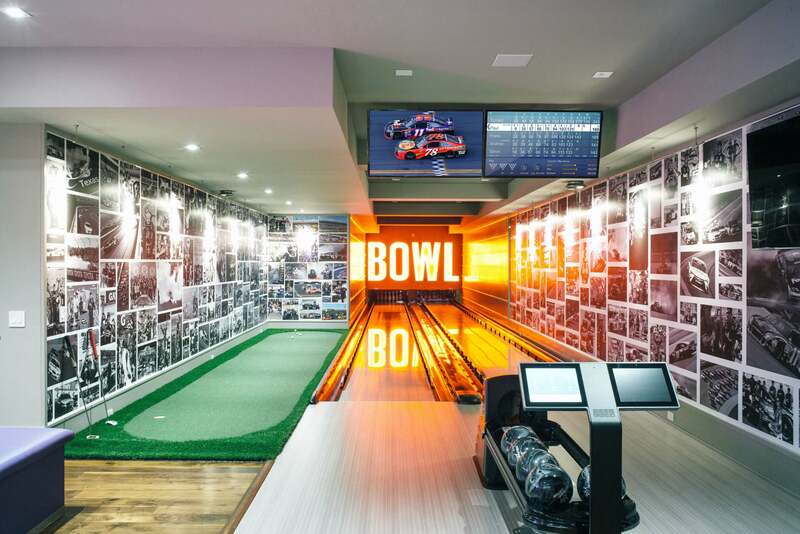 A modern home on Lake Minnetonka with a rock and roll themed single-lane bowling alley. Large TV on the rear wall above the pins, built-in storage for guest shoes and balls. 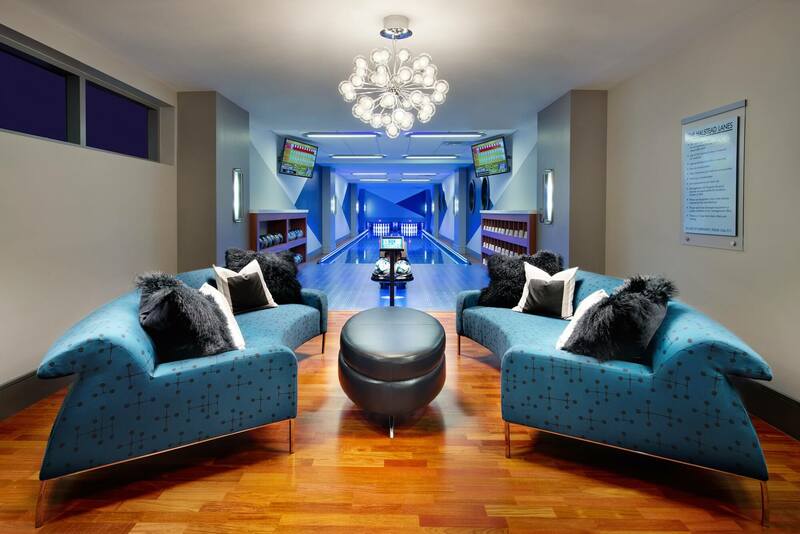 A residential basement bowling alley with pearlized blue and green balls with custom logo, built-in shoe and ball storage, custom pins, neon LED accent lights, and banquette seating. 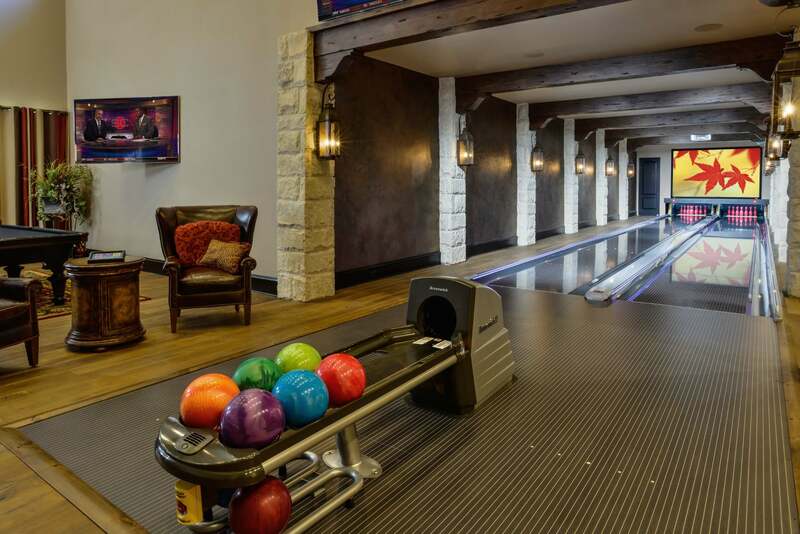 Snuggle in at this rustic lakeside family sports barn equipped with a four-lane bowling alley with custom lanes, pins, and masking units, and Brunswick computer scoring. 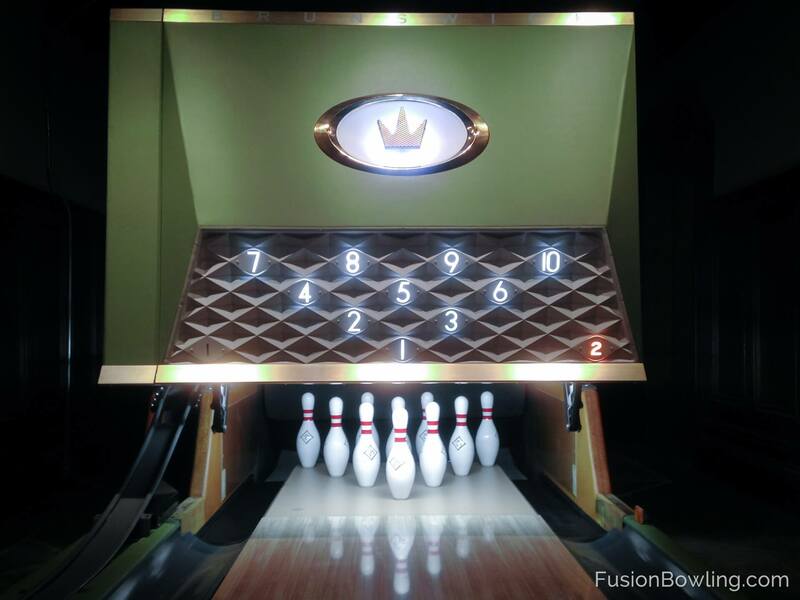 This luxury high-rise apartment on the Hudson River across from Manhattan features a bowling amenity by Fusion Bowling. 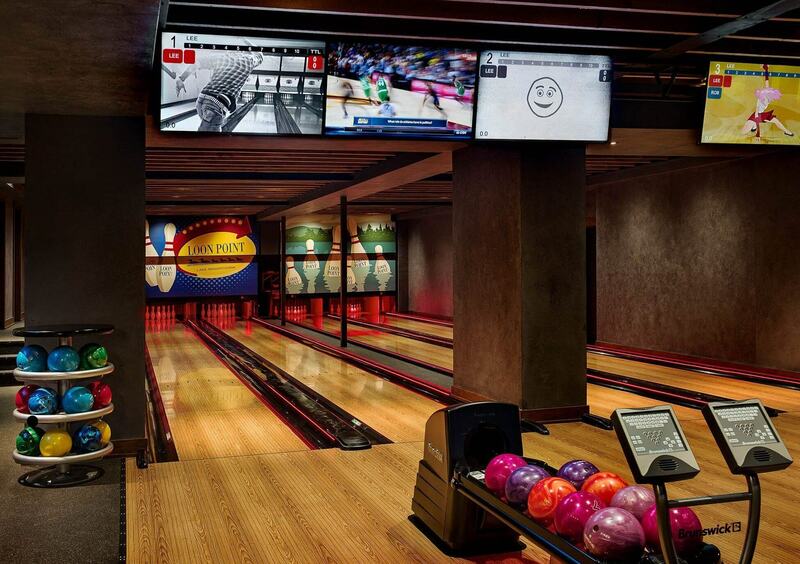 TVs near the lanes can provide instant replay of the bowler's shot. 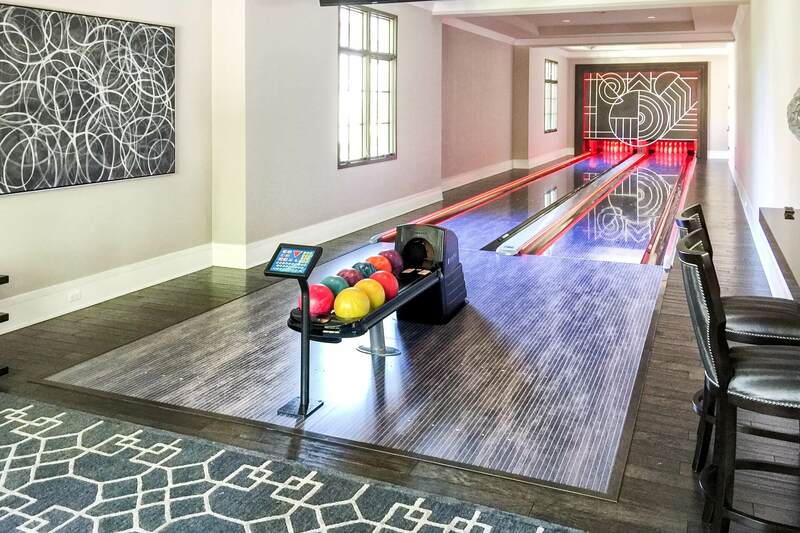 A private home near Dallas with "Caluna Cherry" lane color, black capping, custom pins, and black pearl guest bowling balls with the homeowner's logo. A neon pegasus symbol is mounted to the rear curtain wall. 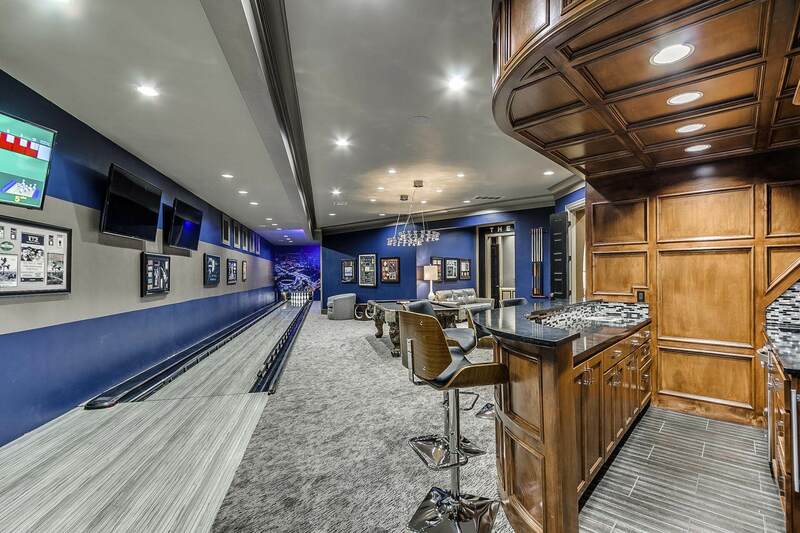 A spec home built for the Street of Dreams builders' showcase has a single bowling lane with "Wedding Cake" lane color, custom dark blue pearl bowling balls and a mural of the OKC skyline on the curtain wall. 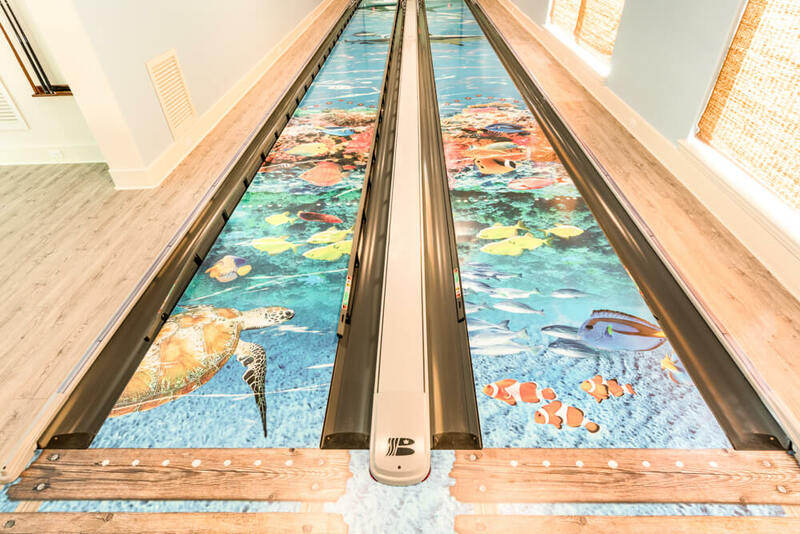 Ocean artwork covers the entire surface of these lanes. The approach is a dock, and a 'V' formation of baby turtles serve as lane arrows. Custom balls and pins show the homeowner's logo. 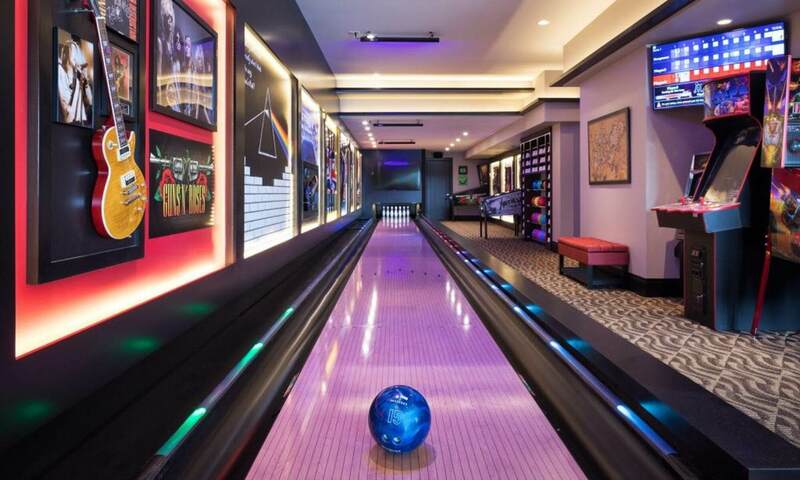 A private home's video game arcade and bowling area has custom "Ivory Cirrus" lanes, LED accent lighting along the gutters and under the ball return rack. The epoxy floor and wall wraps are space themed. 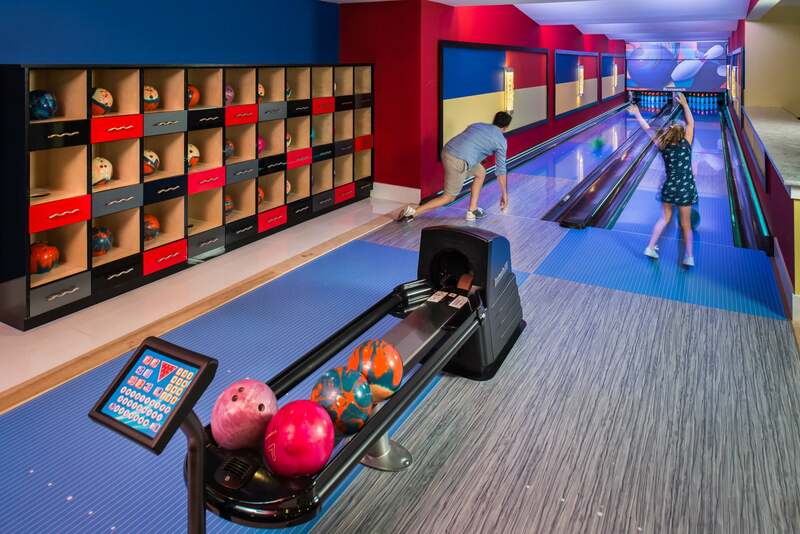 Single-lane private bowling alley has a wall-mounted scoring monitor, "Baltic Fresco" lane color, pins with homeowner's initial, and beautiful back-lit translucent panels on the curtain wall and side walls. A rustic recreation building and garage for classic cars that features a "Pyrenees Marble" lane pattern, custom logos, billiards style house balls and custom masking unit. 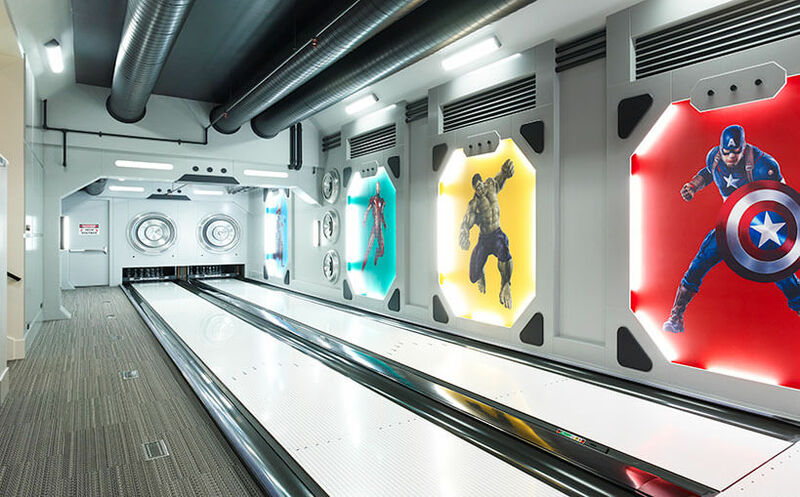 Amazing comic book hero themed home bowling alley has custom made balls, pins, and shoes, all with the homeowner's logo. Custom "chalk white" lanes against an industrial bunker motif. 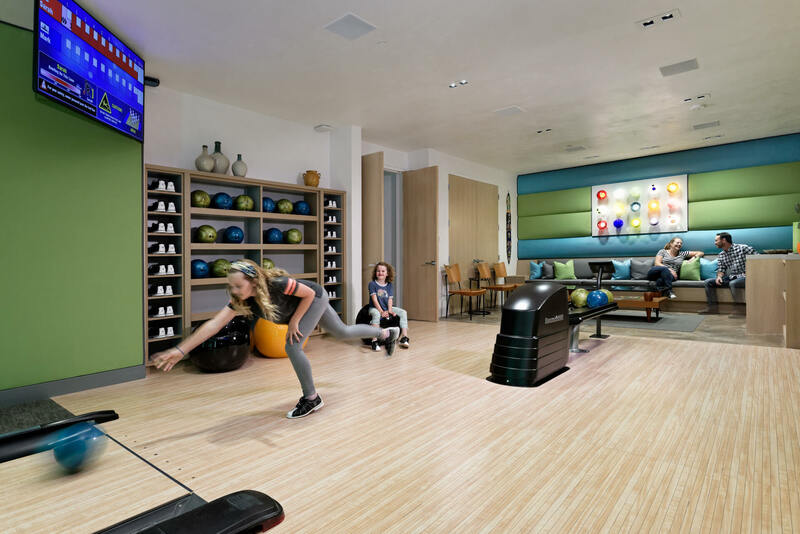 Contemporary style multifamily apartment amenity branded as "The Lanes." Features built-in storage for shoes and custom bowling balls. Lane color is called "Singing the Chicago Blues." 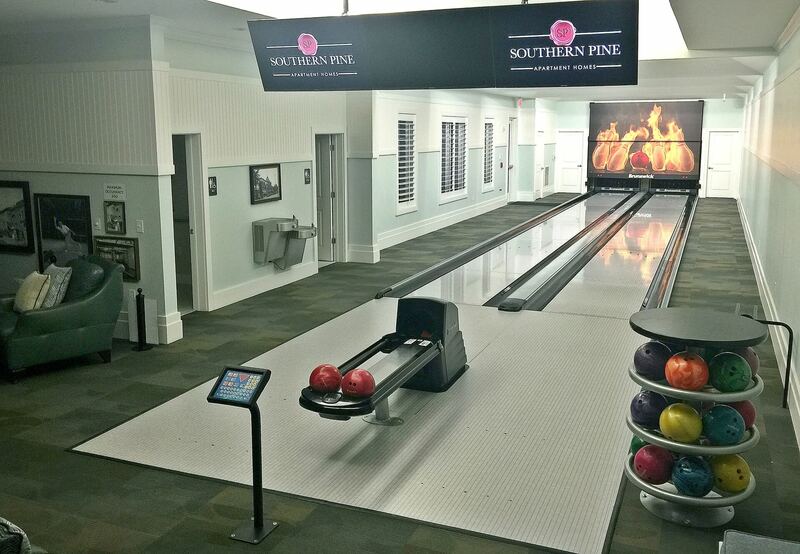 Daytona 500 NASCAR champion Denny Hamlin's home bowling alley has custom gray woodgrain lanes and SYNC scoring. The lanes, balls, and pins were all custom made with the Victory Lanes logo. 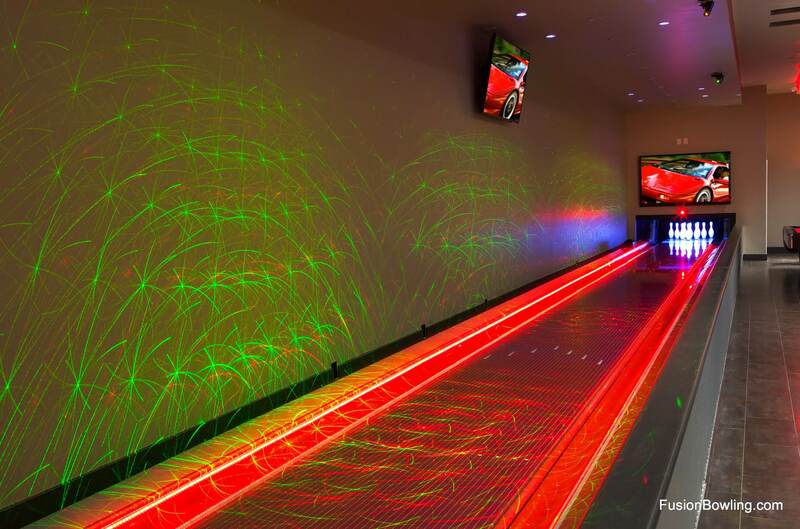 Rapper Lil' Wayne built out a new indoor skateboard park and recording studio facility, and decided to add a single-lane solid red custom private bowling alley by Fusion Bowling. 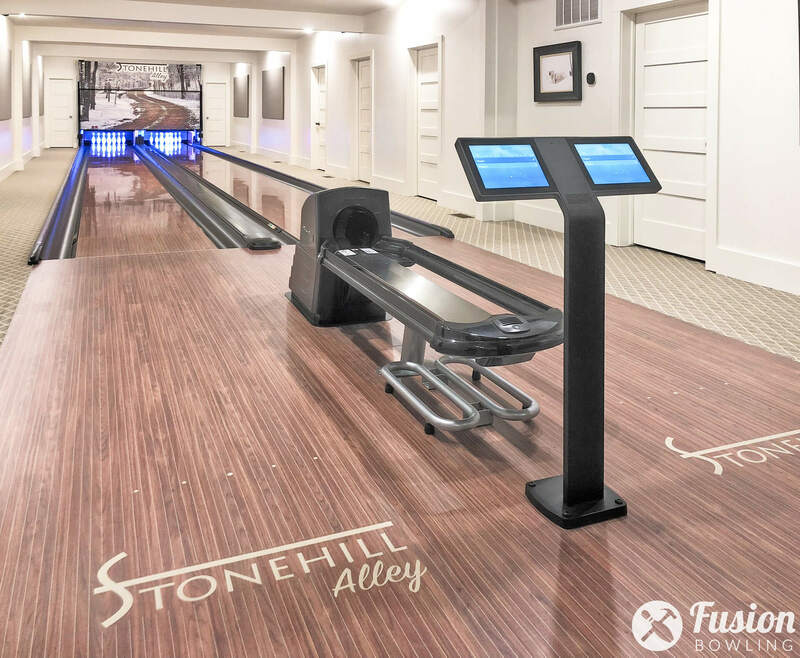 A rustic stone and timber mansion with “Valencia Teak” lanes, neon green pins, 11-foot fixed projection screen, rebuilt A-2 pinsetters, Kegel Walker robotic lane cleaning machine. Vibrantly colored party space is packed with arcade games and has a cartoon outer space theme. The shape of the approach curves out wide to the left side to add interior architectural interest. 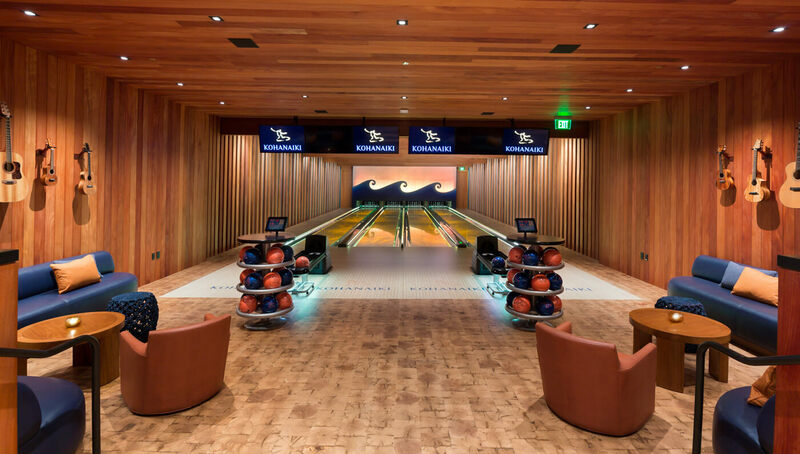 An underground 4-lane bowling alley amenity in the heart of the new $65 million residents-only clubhouse in the most luxurious 450-acre oceanfront residential community in Hawaii. 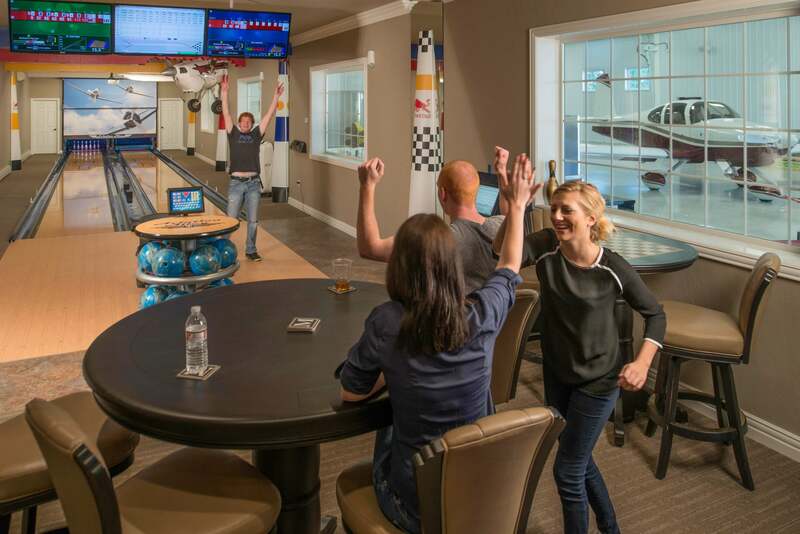 Airplane-themed bowling alley inside private pilot's lounge. Branded guest balls, ball rack, masking unit, and retractable projection screen, and real airplane "crashing" through the wall! 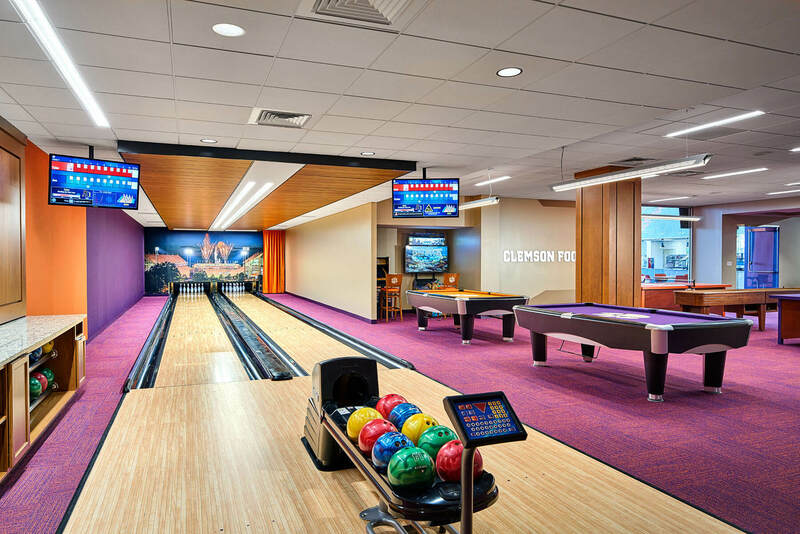 Clemson University's football team wanted a bowling amenity for their new $55 million football operations center. 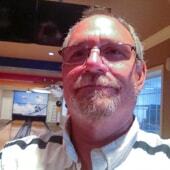 They hired Fusion Bowling, and then won the national championship. Coincidence? 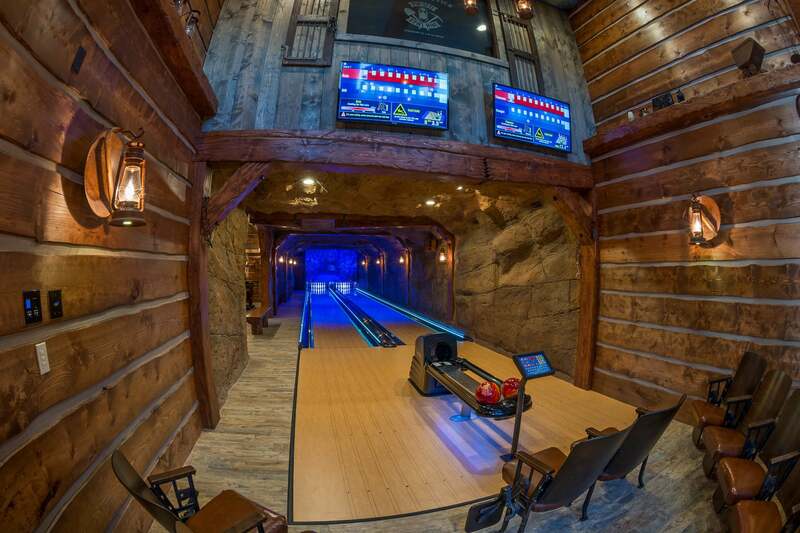 Private bowling lanes in a pool house on Utah Lake is themed on a nearby abandoned gold mine with rock walls and timbers. 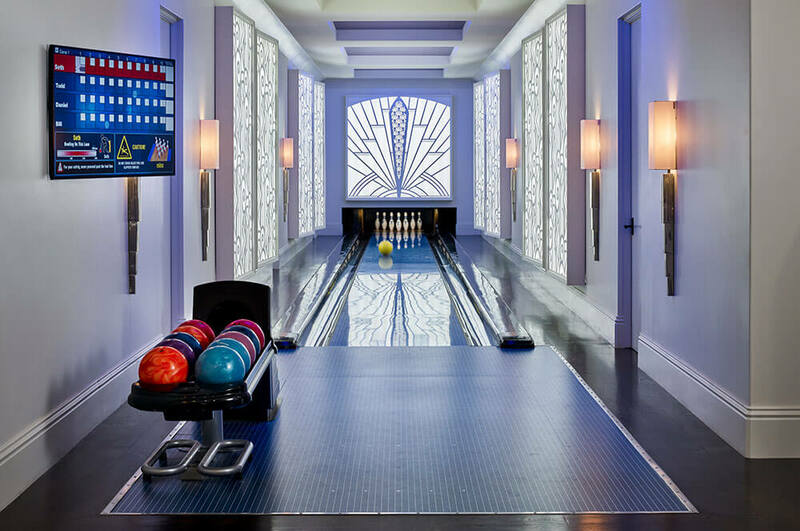 Built-in shelving displays the custom guest bowling balls and shoes. Lane color is Honey Maple. 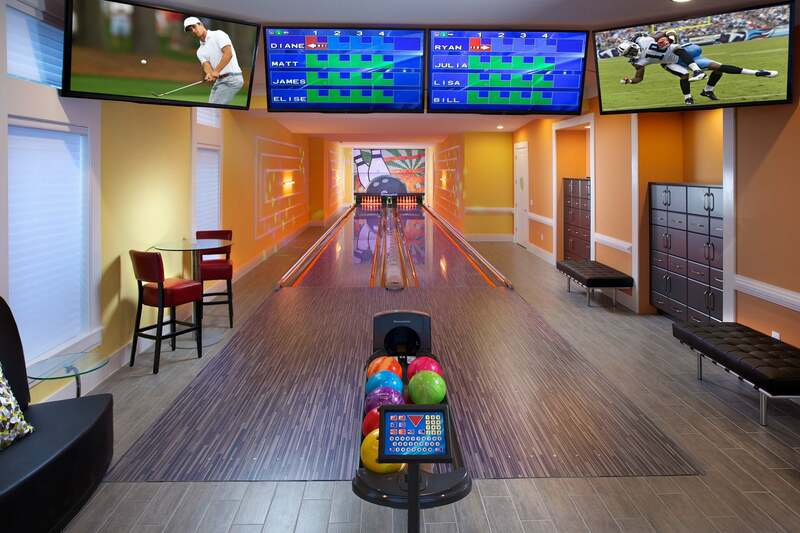 A luxury rental mansion near Disney World with “Modern Edge" lane color pattern, neon orange pins, orange LED gutter lights, guest lockers, and four 60” scoring displays and entertainment TVs. 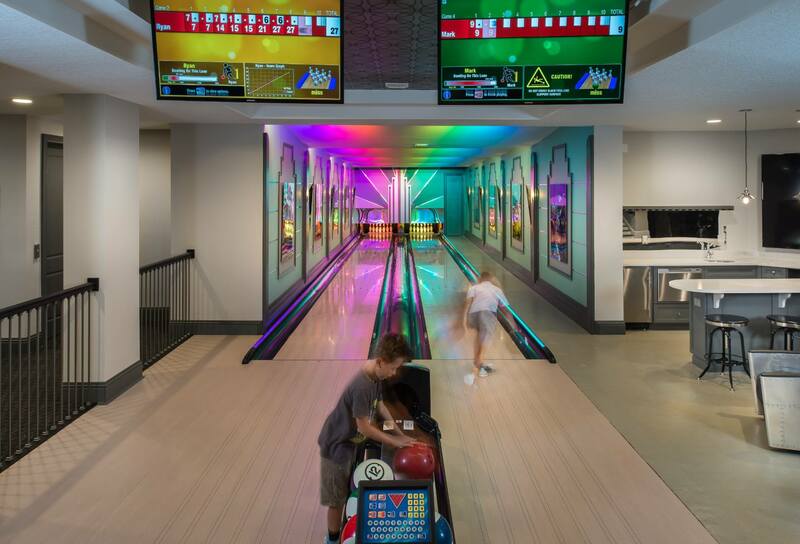 A hip, urban mid-rise apartment development in downtown Seattle included a two-lane bowling amenity with custom painted capping and restored vintage ball return, masking unit, foul detector covers. Funky gray and blue checkerboard lanes with custom orange/blue pins and balls. This mansion has 12 master suites, lazy river, car elevator, indoor basketball, secret arcade rooms, and pool on the 3rd floor! Apartment clubhouse amenity with "Xanadu Blue Bamboo" lane color pattern, custom masking unit with property logo, and blue LED gutter accent lights. Private recreation building with restored vintage masking units with pindicator lights retrofitted with LEDs, over-lane ball return, restored scorer's table, completely rebuilt Brunswick A2 pinsetter machines. 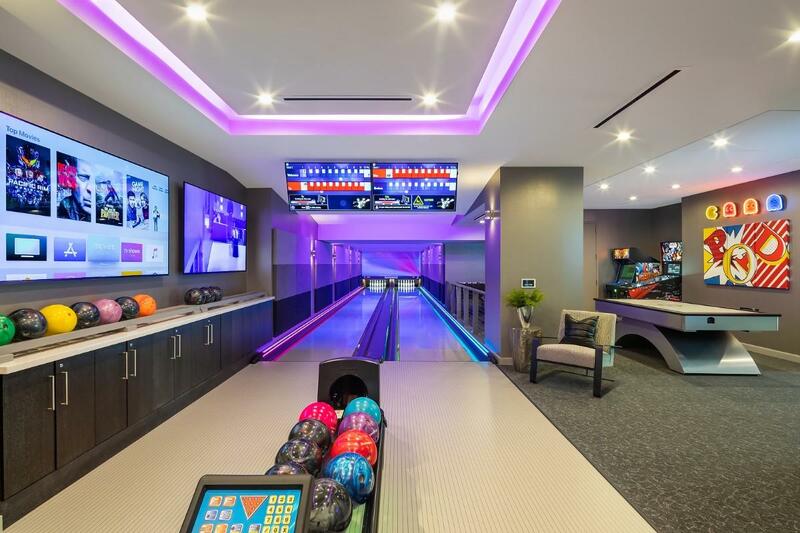 NBA All-Star's private home bowling alley is tricked out with flame lane graphics only visible under black light, violet LED accent lighting, custom black pearl guest bowling balls and custom pins. 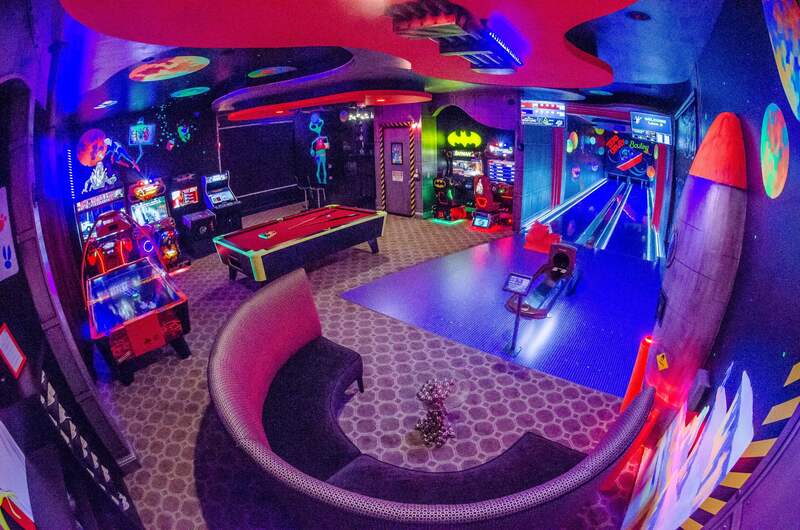 A rare Floridian basement is outfitted with golf simulator, lounge, fitness, and games around the bowling alley in art deco style with rainbow wash lighting. Built-in guest bowling ball and shoe storage nearby. 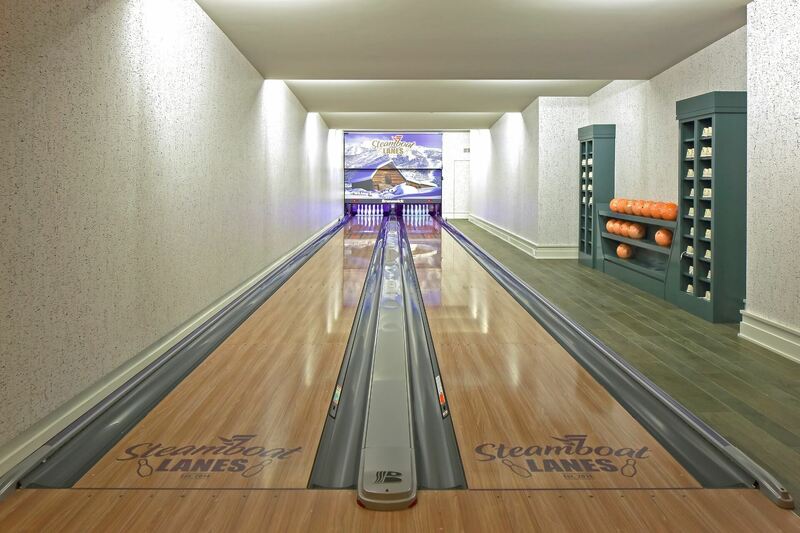 Home on Long Island Sound with a bowling alley theme based on Steamboat Springs, Colorado. "Illustrious Maple" lanes with custom logo. Champagne custom balls, and sky blue custom pins. 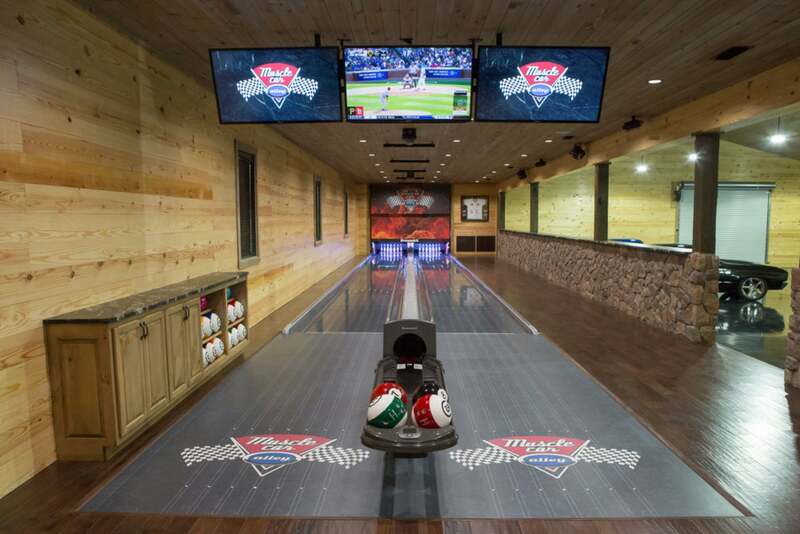 A private vacation home in the Ozark mountains with two elevated lanes in "Babbling Brook" color pattern, SYNC scoring, and custom balls, masking unit, and pins. Apartment clubhouse amenity with four lanes. The fluorescent orange custom pins and orange/gray/white custom balls both have the property's logo. Built-in cubbie holes for ball and shoe storage. 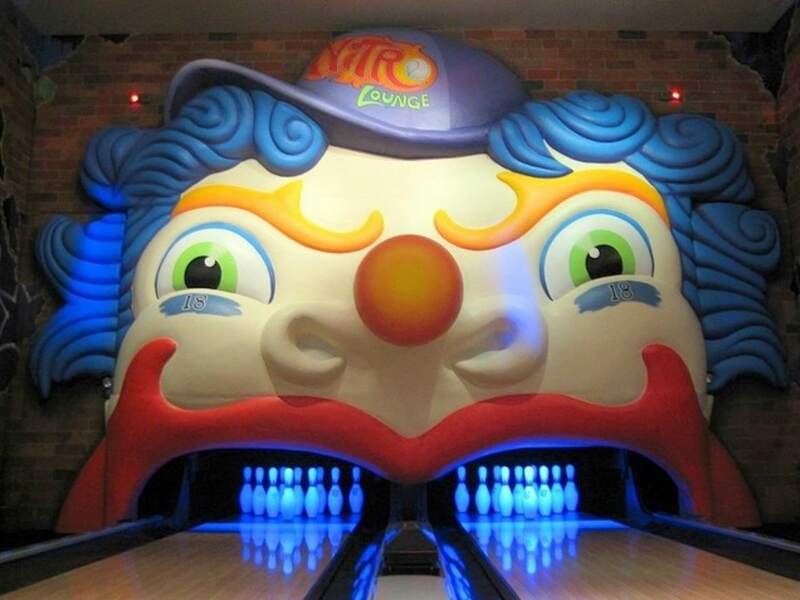 New York Yankees baseball player's home bowling alley combines New York subway signage and graffiti with a giant evil clown face with bowling pin teeth! Guest lockers for ball and shoe storage. 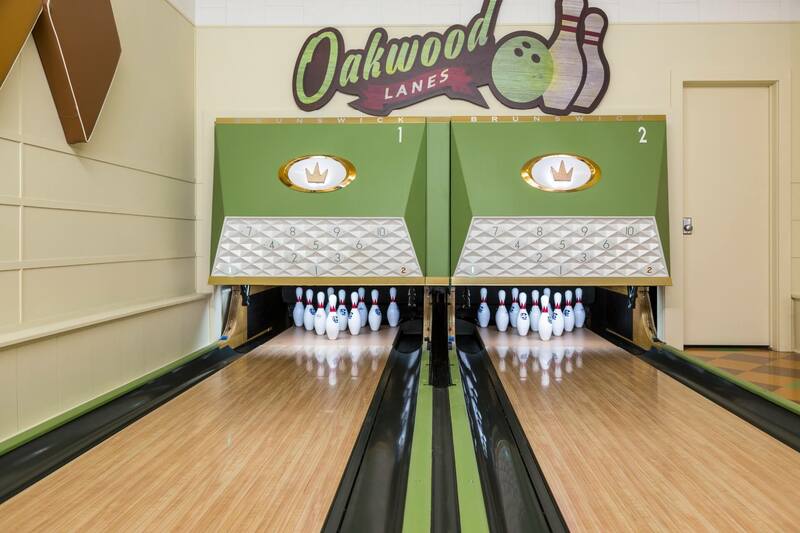 This former Olympian's home has a vintage single-lane bowling alley with over-lane ball return, restored masking unit with LED pindicator system, and a completely rebuilt Brunswick A2 pinsetter. 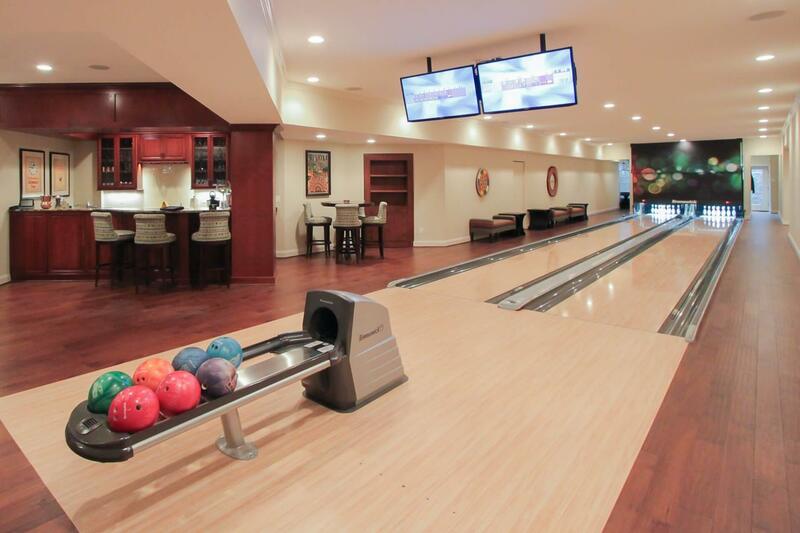 A beautiful house in the woods just outside DC has a basement gameroom with bowling alley, bar, card table, and movie-watching area. The bowling alley has rebuilt Brunswick A2 pinsetters. This guest house sits right on the Atlantic Ocean, and has a watertight basement. 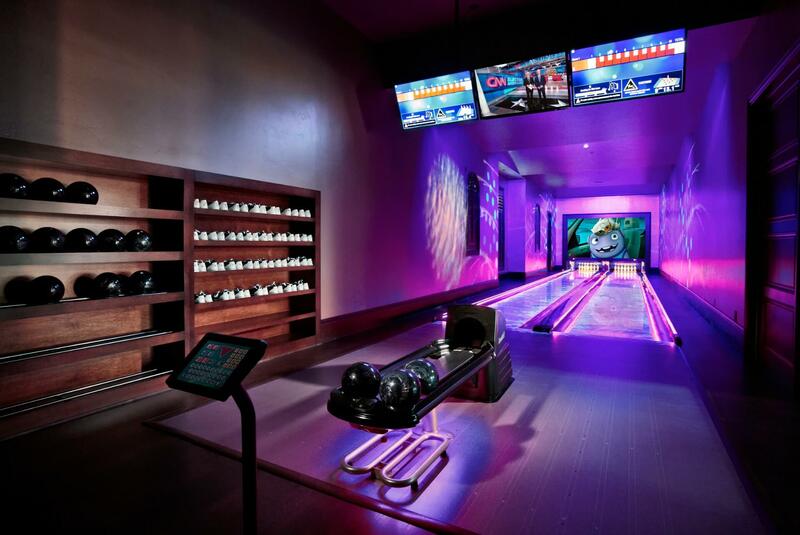 The ultra contemporary bowling alley with black lanes also has LED accent lighting, and custom hot pink/black bowling balls. 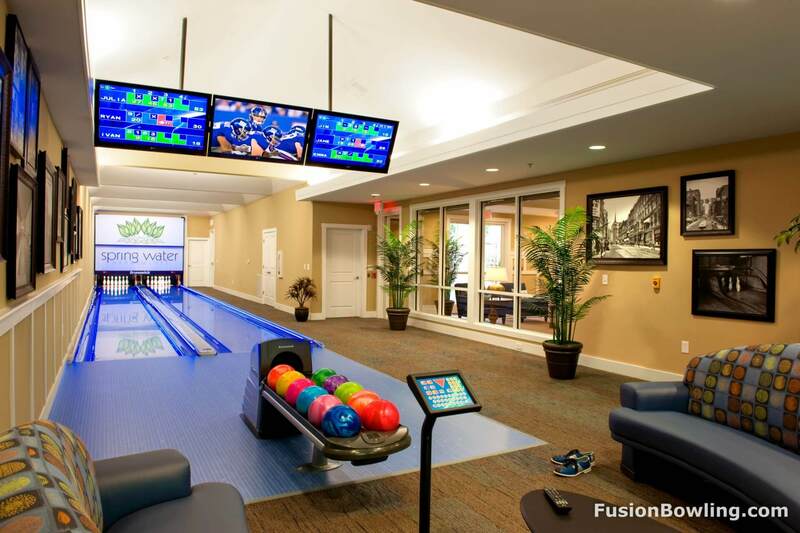 Private bowling alley clubhouse amenity for garden style apartments. 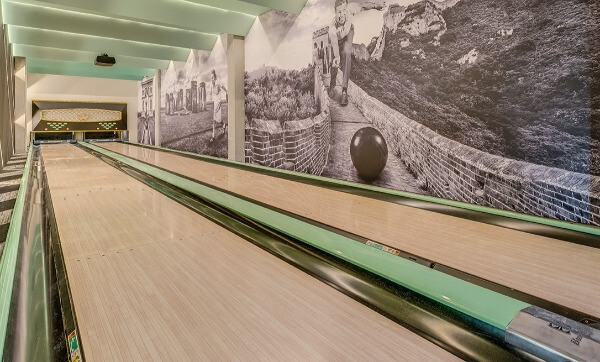 Residents enjoy free bowling on their very own custom white lanes with custom black pins with the property logo.